A few weeks ago, my friend and Editor-in-Chief of FIT Columbus Magazine (Chelsea Castle) reached out and asked if I wanted to write a piece on bicycling for the magazine and while I did, I took the opportunity in a different direction that I feel is a necessary direction; beginning to dissect driving behavior and why we drive the way we do. I’ve been borderline obsessed with driving behaviors and the disruption of routines; anonymity and assumed entitlement when it comes to the driving culture to where I feel if I can construct this topic in the right way, this could make for a thought-provoking TED Talk which I plan on trying. When was the last time you were caught in a light, misty summer rain and loved every minute of it? How about one of those Southwest-style sunsets that burst hues of orange, purple and pink, making it physically impossible to do anything but stop and be in it? Those are just two personal experiences I’ve had when riding my bike. The particular summer night when I was caught in the light rain, I smiled the whole time and never felt more alive. Those sunsets I’ve experienced, I literally lost my breath and had to pull my bike over because I couldn’t not appreciate what was happening. Riding a bike has changed my life. From a health perspective, incorporating my bike as an everyday mode of transport, exercise has become as routine as brushing my teeth. The best thing is that it’s become so integrated, I don’t see it as exercise but as a vehicle to get me to my destination. We think we need high-intensity workouts to keep us in shape, when studies have shown that incorporating bicycle commuting into your daily life improves mental health, lowers risk for cardiovascular disease and can actually increase physical performance as much as specific training programs What if you switched out two errands per month using your bike instead of your car? Try it. I was asked to write a guest piece on bicycle etiquette and safety, but I feel compelled to begin a bigger story; I advocate and fight like hell for safer streets in Columbus. But what does that mean? It’s simple: we need to design cities for people, not cars. For decades, the scales have been tipped in favor of car culture; five-lane-wide streets, one-way roads and very little urban beautification. When you have wide streets with nothing of interest to look at, you get in and get out as quickly as possible. We drive based upon the design of our streets. Think about how fast you can drive on Broad Street then think about how fast you can drive on Gay Street. When we combine streets designed for speeding cars with human beings going three to four times slower by way of walking or biking, the clash begins. Why? Why is there such hostility to the point of violence? Bikes are legally considered vehicles; bikers should be following the same rules. Most of us do. Some of us don’t, and as a bicycle advocate constantly fighting for safer streets, it pisses me off when I see unsafe behavior. But there’s a flip side to that coin; drivers are just as unlawful, sometimes more. Driving has become so commonplace and such a “thoughtless” task that we’ve become lazy and fat behind the wheel; corners are cut because we consider ourselves better than average drivers. What’s it going to take for us all to play nice in the sandbox? I wish I had the answer, but no matter which way you slice it, you’re always going to have the haters who can’t, or won’t, get along. What I want everyone who reads this to know is that when you see me riding my bike, I’m a twin sister and a daughter, a breathing human being and NOT a “cyclist” or a “pedestrian.” Maybe when we start to see each other as human beings instead of these polarizing, sterile identities, the curtain of animosity will be lifted away—forcing us to reintroduce empathy and acknowledge the individual trying to get to her destination safely, instead of just an object slowing us down. It’s been five months since my last public confession 🙂 After five insanely busy months, I have the time to breathe and update those on what I’ve been consumed with. For almost three years, I had been persistently and patiently working on two dream projects of mine: to bring the first ‘Open Streets’ to Columbus as well as piloting Columbus’ first ‘parklet.’ For those reading this that don’t know, ‘Open Streets’ is a free initiative that temporarily closes streets down to autos and opens them up for people to engage in fun, healthy activities like yoga, biking, breakdancing, and more. It’s all about experiencing streets as public spaces. When I was a kid, I played in the streets ALL the time. I rode my bike with my best friends and that’s just what we did. These days, streets are too dangerous. Playgrounds are built far away from the streets because the dangers of motor vehicle speeds and distracted drivers have reigned supremacy. As one of my favorite people says, ‘Sometimes you have to turn things upside down to get them right-side up’ (Fred Kent). I whole-heartedly believe this with every ounce of my being. My two dreams projects did just that, turned things upside down. When it comes to parking and road space we’ve given too much to the vehicle that when we try to do what’s right and step in and change it, people go cray! The idea of closing downtown streets to cars to let people of all ages and abilities ‘play’ in them raised eyebrows. No matter if I came to them showing them the data of other cities putting on ‘Open Streets’ and how ridiculously successful it was/is. Successful from a public health angle. Successful from a business economics angle. Successful from a community engagement angle. Successful from a broader encouragement of multi-modal transportation. ‘Open Streets’ has transformed cities across the U.S. Aside from the hard data, I had the privilege of experiencing Los Angeles’ ‘CicLAvia’ last April. When you think Los Angeles, you think of boxtox and traffic; ‘carmaggedon.’ Los Angeles’ CicLAvia / Open Streets has been such a raging success that they put on 3 / year and close anywhere between 6-12 miles of Los Angeles streets. That is not a typo people. The one I experienced last April, tens of THOUSANDS of people came out and participated in playing and owning their streets – free from motor vehicle danger. What resonated with me, as I stood in the middle of Wilshire Blvd was that so many families and people of all ages and backgrounds wanted to come and have a safe place to ride or play. There aren’t enough safe places to ride and we just don’t slow down enough to appreciate our environment. We have the ability to change our built environment when we realize the TRUE potential. 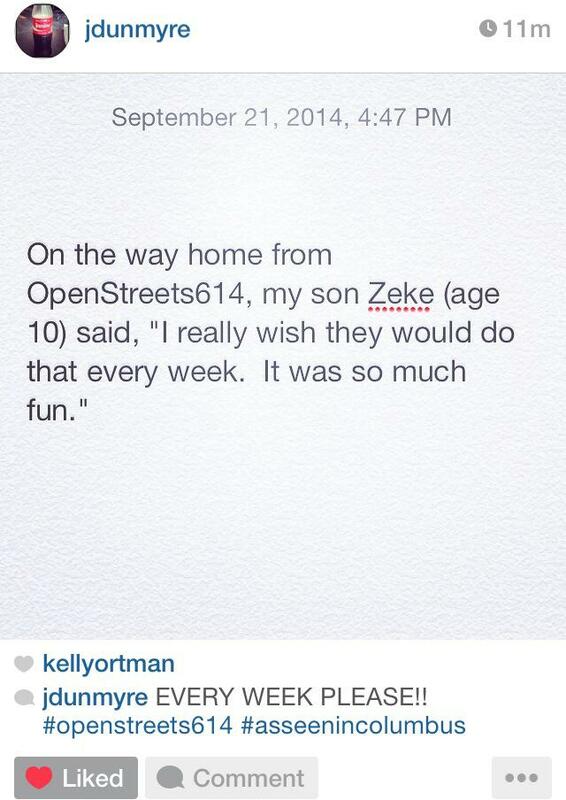 That’s why Open Streets has been so important to me. I’ve seen what it does to people and cities. After almost three years, organizations such as People For Bikes, Transit Columbus, Jeni’s, New Belgium Brewing, Capital Crossroads SID, Columbus Public Health , CD 102.5, Mt. 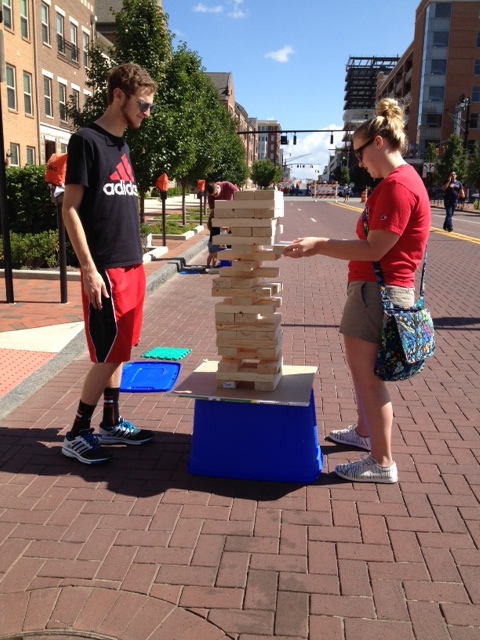 Carmel East, Eccolyfe Designs, CDDC, Skreened, ID2014, and the Great Photobooth; stepped up to the plate and said, ‘we get it and they all invested.’ On Sunday, September 21st, Columbus joined the long list of other Open Streets cities. We closed 0.8 miles of downtown Rich St. 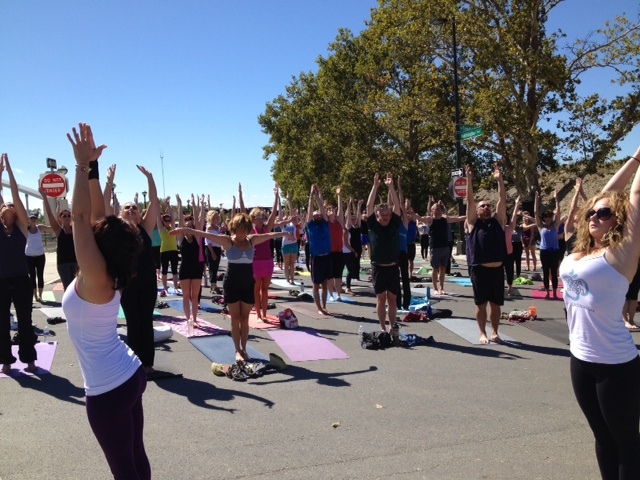 I have to say it was a fantastic FIRST Open Streets for this city. 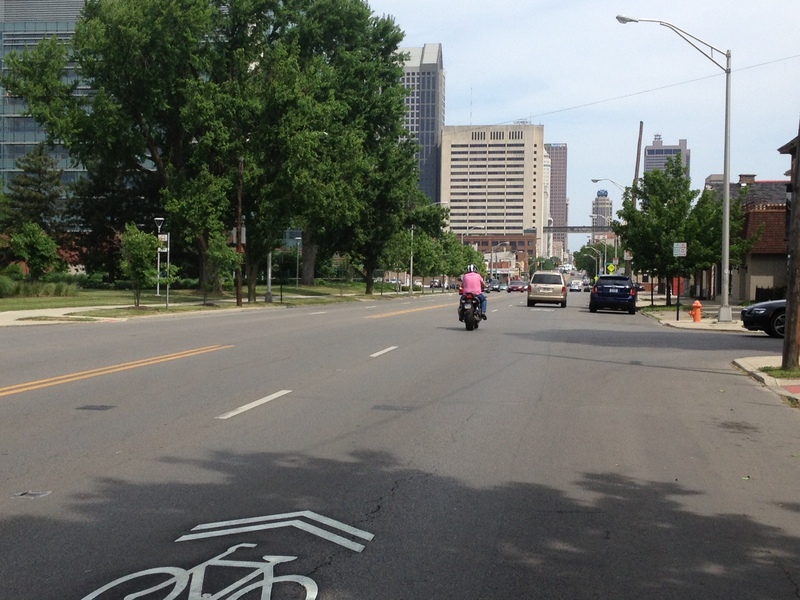 Columbus still has a long way to go in order to be a contending ‘bike-friendly’ city. We’re making great progress but we have a long way to go. 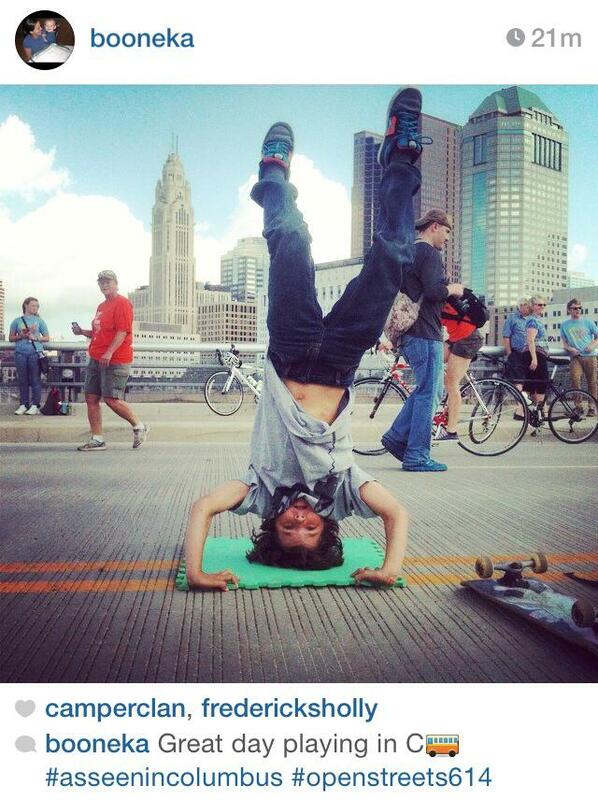 We’ve heard nothing but positive feedback about Open Streets Columbus. Our goal is to aim for ‘2’ Open Streets next year. Success with an initiative like this cannot come overnight. It must be recurring so people understand the concept and purpose. With all the people and kids that came out and enjoyed the day, they now understand why Open Streets is so effective and successful. 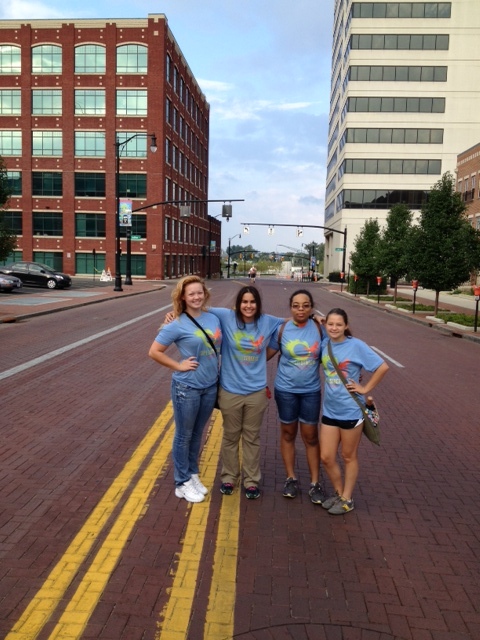 All of those people will be future cheerleaders- spreading the Open Streets Columbus love as we put on future events. I loved seeing how many kids were there. I loved watching the parents not have any fear b/c that fear had been removed. People laying a blanket out in the middle of the street b/c they could. Getting people to look at their streets differently; seeing their streets as public spaces instead of only cars and parking is why Open Streets is so effective. We had about 18 high school students from the Mosiac school volunteer. They loved it and we loved having them! 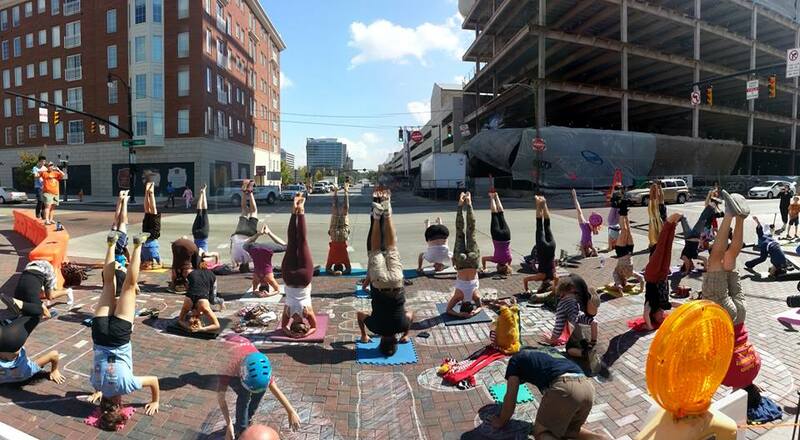 Headstand challenge at the intersection of High and Rich. I can bet this is something you don’t see everyday! Our ‘Scioto Beach’ was one of the biggest successes of Open Streets. 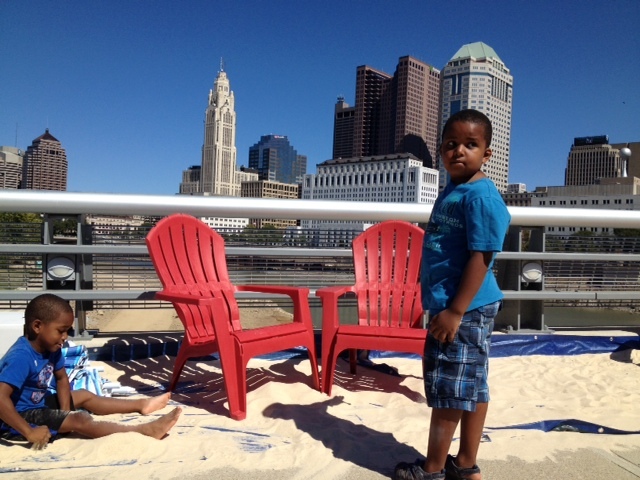 Yep, we built a small beach on the Rich St. Bridge. Kid approved! The comment above is the reason I have fought for Open Streets for so long. This is exactly how we want people to feel. Switch gears to the ‘Columbus Parklet Project.’ We had the great opportunity to unveil Columbus’ first parklet at the great Independents’ 2014. Getting more eyes and butts in the parklet would only help generate more buzz for the 30 day pilot over at Dirty Franks downtown. It sure did. 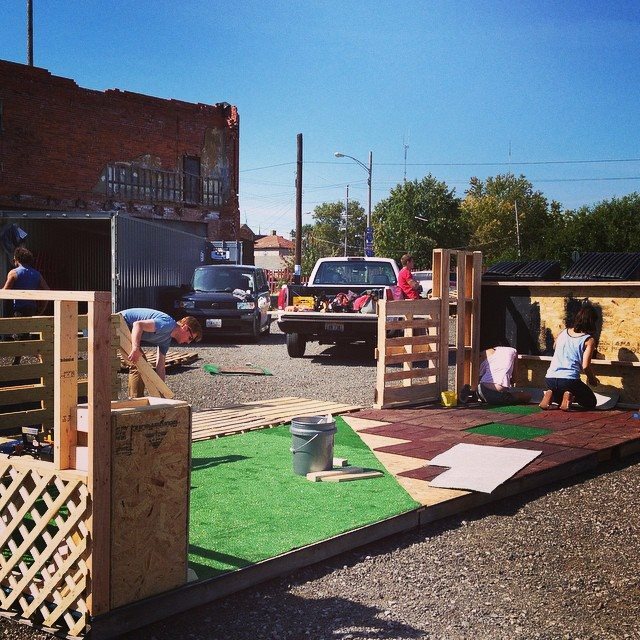 It just so happened that unveiling the parklet at ID2014, was the same weekend as Open Streets Columbus. Needless to say, I was stressed, excited, anxious, and hopeful. No NEW project would be complete without its obstacles and we sure had some of those. But, you push through and you take every moment as a teaching moment which I did. 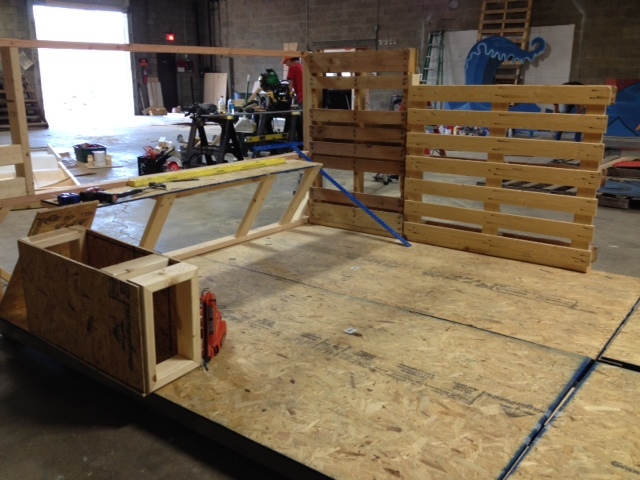 The parklet was a great success at ID2014. The following week it was moved outside of Dirty Franks Hot Dog Palace where it’ll be there for one month for the public to embrace (hopefully). Again, this is a concept happening in other cities that are getting people and businesses to re-imagine the potential within our city streets. Over 82% of drivers are single occupancy. You drive your car to Dirty Franks, you park right out front and its YOU…one person. You remove that parking space, convert it to ‘people space’ allowing people to sit, eat their lunch, converse, and just be visible to other drivers passing by, you automatically create buzz. If you’re a business owner giving people a place to sit and stay for while, chances are they’ll spend money. The idea of the one month pilot is to introduce the concept to both the people of Columbus and business owners. The sky won’t fall if you remove one parking space usually taken up by ONE person and you convert it to where 12+ people can share and enjoy it. 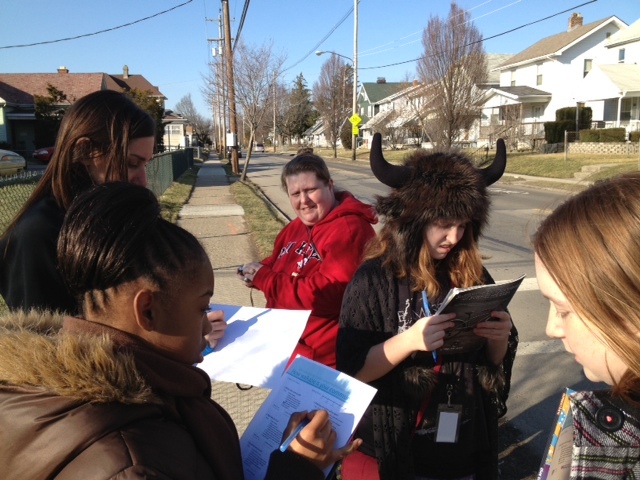 We’ll collect data over the month during different times of the day as well as public feedback. Thus far, its been super successful (minus a few haters and there always will be). The Columbus Parklet Project had great support from businesses such as: MKSK Designs, Dirty Franks, Kaufman Development, Creath Landscape Design, Drift Industry, DRAC, Eccolyfe Designs, Columbus Eye, Square One Salon & Spa, and Wolf’s Ridge Brewing. What really catches my eye is that every one of these businesses has nothing to do with the other. They all come from different backgrounds yet they all see the Columbus Parklet Project as a great, fresh concept and are willing to invest. Our goal is to get buy-in from this 30 day pilot to where we are able to expand and build new parklets with new designs in different parts of Columbus. These small ‘interventions’ within our streets can become ‘destinations’ for people. 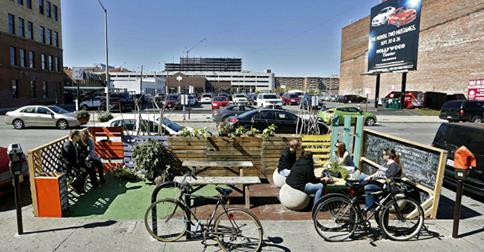 Parklets are part of the ‘lighter, quicker, cheaper’ strategy that many cities are embracing. When people can be a part of a project from beginning to end there’s more personal investment that happens and a sense of ownership and pride. I had some incredible people step up to help make this first parklet a reality: Ryan, Michael, Carey, Jess, Jerry, and Sarah. Here are couple photos. I encourage you to take a jaunt over to Dirty Franks within the next month. Purchase a dog and have a seat in the parklet. Setting up before the big ID2014 weekend. Lots of traffic during Independents’ weekend. 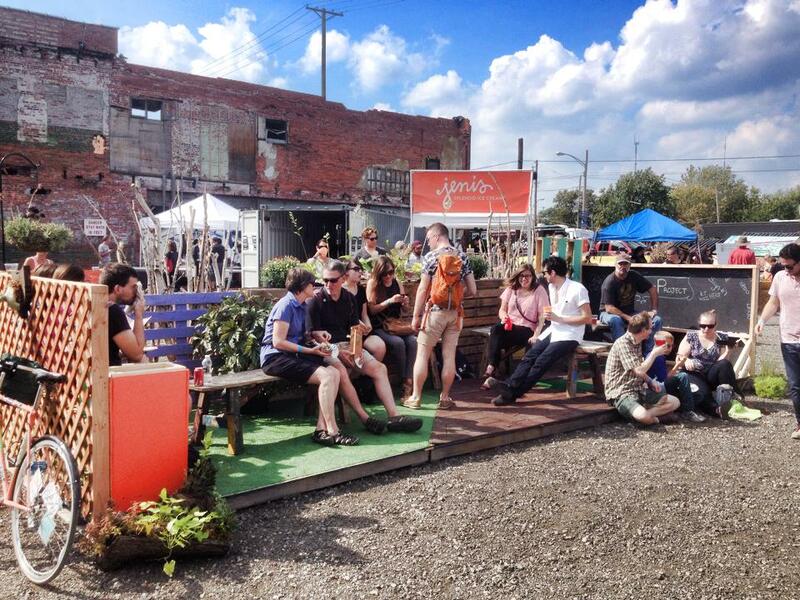 The Columbus Dispatch published a piece on the parklet this past weekend. And those are two of the projects I’ve been up to:) These two projects have meant so much to me and I believe that with time and iterations of both, the people of Columbus will embrace. I look forward to both Open Streets Columbus and the Columbus Parklet Project expanding and becoming initiatives that people support and want to be a part of. Yesterday, while waiting at a bus stop in German Village, I, as I usually do, watched interactions between cars and pedestrians. At this four-way stop, I observed how unsafe and how NON-functional this intersection is for pedestrians. Design should always be about US – the end user. How we use it, it is comfortable, is it uncomfortable, is it functional for everyone. We’ve given complete control and power over to autos. Even as pedestrians, when we have the lit ‘walk’ sign and someone is about to cross in a crosswalk and a car approaches- getting ready to potentially turn right, they inch their way into the crosswalk. The pedestrian hesitates and then once they see the car stop (in the crosswalk) the pedestrians gives the ‘thank you for allowing me to cross’ gesture. They should never have to ‘thank’ the driver for allowing them to cross during a lit ‘walk’ as this time is deemed PEDESTRIAN CROSSING. But, we’ve allowed this and we need to start taking it back. I watch so many pedestrians be inconvenienced while crossing in a designated crosswalk b/c a driver has stopped beyond the ‘stop bar’ and into the crosswalk, or, the street has been designed for cars to excessively speed. Pedestrians stay silent and remain inconvenienced. There’s such an overwhelming dominance of letting cars overpower our streets and our safe places to cross that I’ve even been honked at, while crossing in a crosswalk. I’m sure someone reading has as well. The three photos below show poor and unsafe design for pedestrians at a four-way stop in German Village. The first image. Take note of where the stop sign has been placed, the stop bar for where cars are ‘suppose’ to stop and the crossing ramp. The stop bar should be IN FRONT of the stop sign a few feet so that FIRST, the car stops and yields to pedestrians and second, the pedestrian has safe space to cross the street. This is unsafe and poorly designed. It also creates confusion on the pedestrian end. The pedestrian waiting to cross should always have the right-of-way. This image gives the perception that since the stop bar is ahead of the pedestrian ramp that the car has the right-of-way. Wrong. And as you can see with the car stopped here, it’s completely overtaken the pedestrian crossing space. Image two: This is the stop sign looking west from that four-way stop. Notice the stop bar that’s INSIDE the space where pedestrians cross. This is an easy collision between a driver and pedestrian. I’m sure the stop sign is placed where it currently is due to the lack of sight from the right side however, all cars must stop here. The stop sign and the stop bar can be placed back a few feet to create safe crossing for the pedestrians. This third image is just plain lazy and dangerous. Instead of the stop sign having its own pole, it’s slapped on the utility pole. Look at the placement of the stop bar. The utility pole is encroaching the ramp of where pedestrians are diverted to cross. I cross this portion of the four-way stop, ALL the time and I’m angered by it. It’s a lawsuit waiting to happen. Again, this kind of poor design is not functional for strollers, people walking their dogs, etc. This. Is. Dangerous. It also puts forth the perception that cars are first, pedestrians are second. Wrong. This is just one four-way stop intersection. I’m bringing this to light to show that design must be usable, SAFE, and functional for ALL users of the road. Think about other places in your neighborhood that have been designed based up creating comfort FIRST for the driver and THEN for the human being. Fish swim. Birds fly. People walk. We are ALL pedestrians before we are drivers. We MUST be more vocal when it comes to safe spaces to walk and cross. The images below are just a few images of how many cars stop INSIDE crosswalk, potentially creating unsafe and dangerous space, in the space that’s ‘suppose’ to be safe for us to cross. This is a BIG reason why so many ppl cross at mid-block (its safer). Next time you’re crossing at a crosswalk, take note of where cars are stopping, and if they are in YOUR pedestrian ‘safe’ space, educate them! 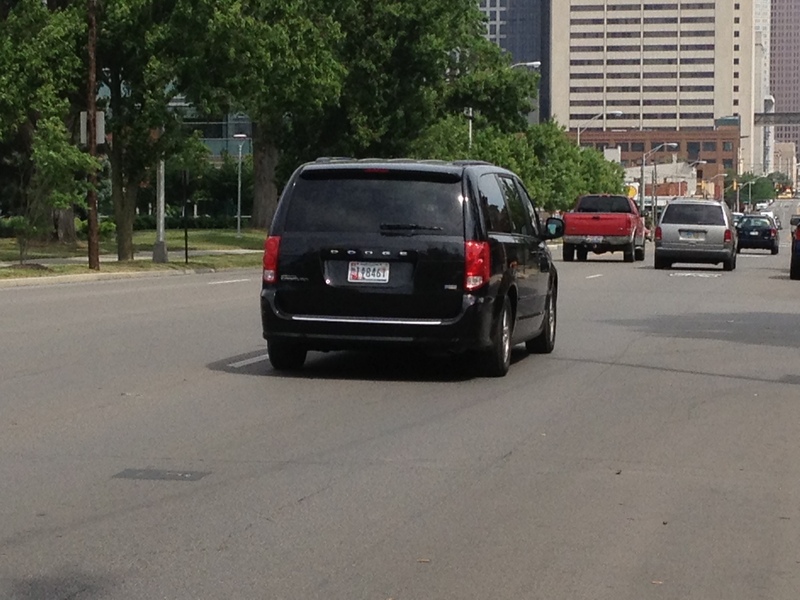 Next time you’re driving, I hope you properly stop and provide safe distance for pedestrians to cross. And take a look at where other cars are stopping. The pedestrian is IN THE ROAD crossing! I’ve heard Mayor Coleman speak dozens of times and there’s one sentence that has stuck with me for years. Yes, years b/c I heard it years ago during one of his ‘Bikin’ Mike,’ ‘Bike to Work Week’ public appearances. He said, ‘if we (as a city) remain status-quo, we’ll continue to get left behind.’ Obviously, this is in reference to bicycling within Columbus. In 2009, Columbus received its first ‘Bronze Award’ for ‘Bike-Friendly Community.’ It’s an award given through the national bicycling organization – League of American Bicyclists. You have to apply for it, give very detailed information regarding all the bicycle facilities that have been implemented and projects that are currently in progress. In 2009, Columbus was awarded the Bronze. It’s 2013, four years later and guess what… we’re still a Bronze. Bicycling Magazine named the Top 50 bike-friendly cities in the country and we have remained in the lower 1/3 on that list – 34. The top cities as you can gather: Minneapolis, Portland, San Francisco, D.C., Seattle, and Tucson to name a few. These cities are designing their streets with ‘8-80’ in mind. This means their planners and engineers are designing and inviting EVERYONE to ride and feel safe while they’re riding. They are installing protected bike lanes, bike boxes at intersections, dedicated bike signals, and painting their bike lanes green so that these lanes are clearly visible to all users on the road. They are clearly making biking a priority and they are showing with these types of infrastructure projects that there’s more to the 21st century transportation mix than just cars. These cities are at top of the list b/c they have the political will, they aren’t afraid to upset people b/c are noticing that many more ppl WANT alternatives to move around their city. And when you give them well-designed infrastructure to ride, they are going to ride. We ARE being left behind b/c our political will is….lack luster when it comes to REAL bicycle infrastructure and the most recent / perfect example is South High St. Yesterday, I was biking home, using South High and noticed something new. 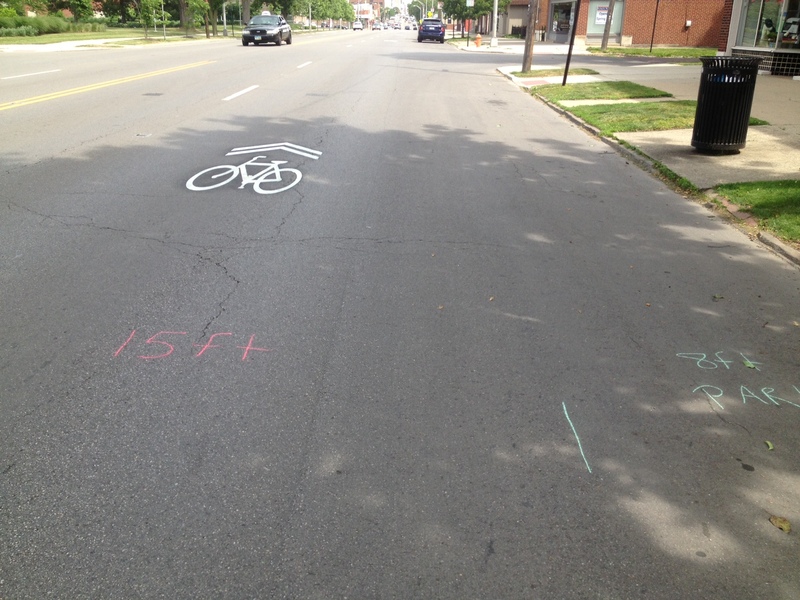 Sharrows placed north and south on S. High St. from Livingston Ave. to Thurman Ave. I was upset. 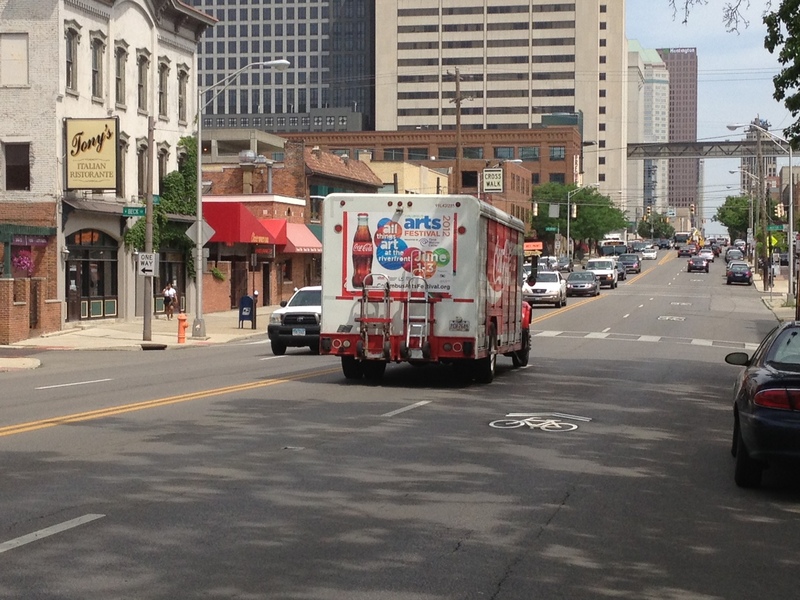 If you all know S. High St. it is yet another inner-city freeway – CLEARLY in need of being slowed. I layed in bed last night tossing and turning b/c I know that S. High is yet another street we’ve lost an opportunity to redesign in the CORRECT way and I’m about to break it down for you all. This morning, I went to S. High and I did some work. I took some chalk and photos and I’m going to show you that this street HAD every capability to have bike lanes in both direction and if the city really wanted to ‘WOW’ us, they could have created the city’s first protected bike lanes. 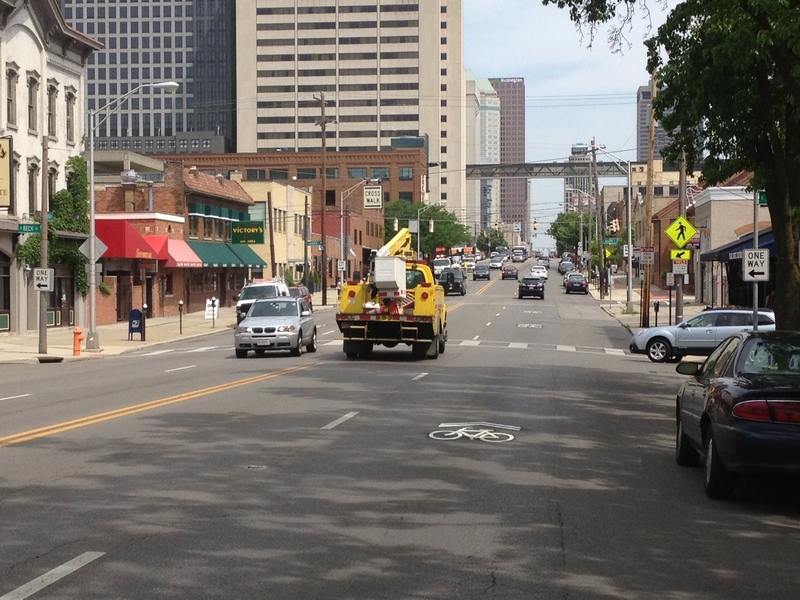 I took measurements in three different intersections of S. High to see if this street’s width altered at all. It didn’t. This is the intersection of S. High St and Frankfort St. As you can see from my chalk markings – the parking lane is 8ft wide (average parking width) however, from the blue chalk line to the boundary of the white-dotted lines that separate the travel lanes, the right travel lane is 15 ft wide. Completely UNACCEPTABLE that a lane is 15ft wide! When you have a lane 15ft wide, you are INVITING cars to speed! The left travel lane is 10ft wide. The same measurements going in the opposite direction. A bike lane is usually 5 ft wide. Clearly, what SHOULD have been done was to reduce that 15ft travel lane to 10ft in both directions. This frees up 10ft (5ft in each direction) to be used to create bike lanes. Now, here’s where political will and being bold comes in, the city could have bumped the cars out from the curb 5ft creating a protected bike lane and slowing the traffic. The protected bike lane would essentially be protected from moving traffic due to the parked cars. And, this type of facility creates an even bigger buffer for the pedestrians. ‘Dooring?’ well, that issue / concern would be drastically reduced b/c the bike rider is traveling on the side -the passenger door and over 80% of drivers these days are ‘Single-Occupancy Vehicles, SOV’ – meaning driver only. Just a shot of moving traffic. But this also shows the extreme width of this street. S. High St. has pockets of mixed-use buildings however, development is not increasing on this street and hasn’t b/c of the design of this street. It is clearly a street to move cars north and south at a minimum of 40mph. Let me also state that if bike lanes were installed and / or the protected bike lanes installed – there would have been no removal of parking nor the removal of any travel lanes. Then there’ s this and I’m sorry its so small. This image is our city’s ‘Bicentennial Bikeways Plan’ which was approved in 2008. The bottom of this page shows what the colors mean. 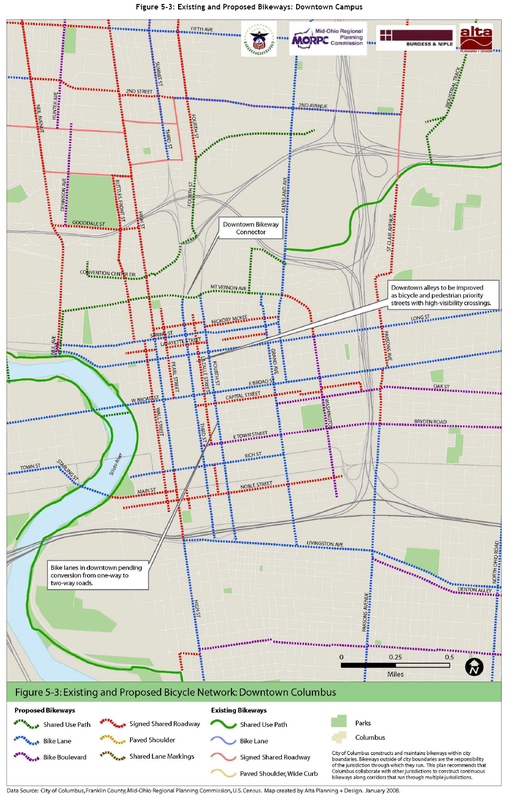 ‘Existing and Proposed Bicycle Network Downtown Columbus’ and if you can see the dotted blue key means ‘bike lane.’ Scroll up to the image of the city streets and if you can read, S. High St. it shows ‘proposed bike lane.’ So, what has changed from 2008 to now?? The street width sure hasn’t. Now, S. High St. wasn’t an ‘automatic’ for getting bike lanes but clearly the individuals in charge thought in 2008 that S. High St was wide enough to get bike lanes and once again we’ve resulted in lack luster infrastructure i.e. sharrows. Our ‘Bicentennial Bikeways Plan’ is slowly turning into the ‘Bicentennial Sharrows Plan.’ Sharrows do not slow down traffic and they do not invite the mother who wants to hop on her bike with a trailor in tow with her kid to bike on a street this fast and this wide. 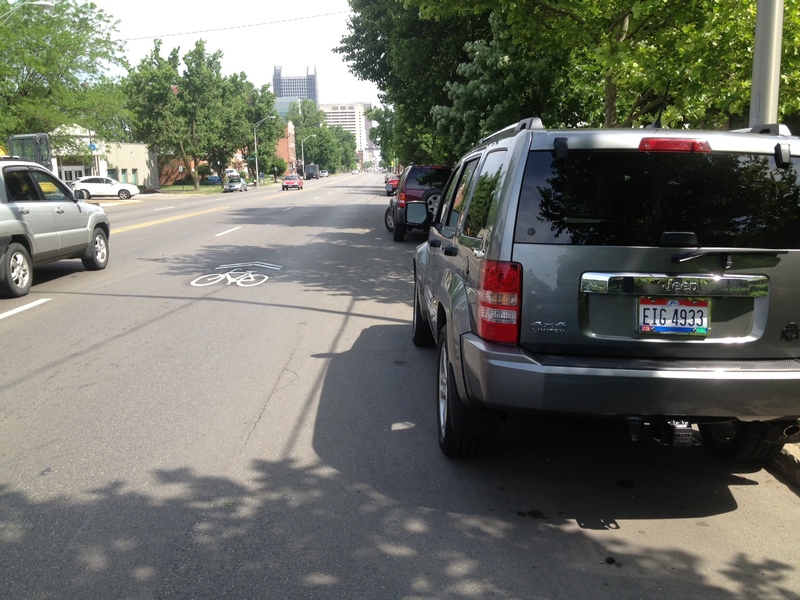 Why does Columbus continually remain in the lower 1/3 list of ‘bike-friendly cities,’ this is the a perfect example. We had an opportunity and took the easy way out. We’re keeping drivers happy with not changing the design of our street and we’re not doing anything to invite new bike riders to explore our city. 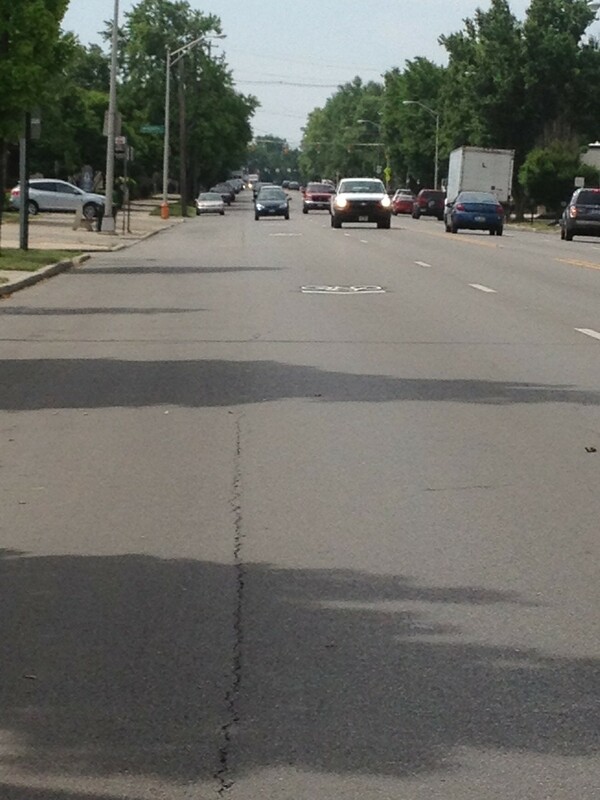 What new rider (man or woman) is going to feel ‘safer’ now that sharrows are placed on this street? It doesn’t change the fact that the right lane is STILL 15ft wide. The speed limit on this street is 35mph however, due to the nature of this poorly designed street, the cars easily go 45mph. Both of the images above are of the only real area where folks walk from the downtown buildings. This area is also the only cluster of businesses and half of these business turn over. I can guarantee that one of the main reasons there’s high turnover with these businesses is b/c of the street design. When you’re going 40mph, you’re clearly driving to your destination and nothing more. This area has every opportunity to develop. You have three neighborhoods that are walking distance yet you hardly see walkers on S. High St. and it’s b/c of this street design. Question: Do you prefer to stroll down High St. in the Shorth North or Gay St.? Or would you want to walk down S. High St? Aside from this cluster of ever-changing bars/restaurants, there’s NOTHING to draw you, nothing to invite you to walk down S. High St. It’s not comfortable. And this will remain until the street scape is changed with all users in mind. Years of driving dogma have spawned generations of amoral with a sense of entitlement. A few more words were exchanged, the light turned green and since he was finally ahead of me, he was able to again maintain his driving cadence of 25 mph as oppose to my 15 mph. I got home and couldn’t shake this particular instance. I’ve had ppl intimidate me with their cars and I’ve never had anyone verbally threaten that they’d end my life.’ I rang a friend of mine who really helped me put this situation into perspective. I could have handled the situation differently and I was beating myself up for it. But, my friend told me that that person was my teacher – teaching me how I can improve myself the next time b/c there WILL, inevitably be a next time. Thank you, JLa. I’ve written a ‘Will’ in case I die and its b/c I ride a bike. How many drivers have written a ‘Will’ b/c they drive a car? I bet I could gamble and say ‘not a whole lot.’ I constantly think and obsess over WHY, we are in such hurries that when we are slowed down, it infuriates us. Why, as drivers, when we are slowed down, we have such anger and violence within us that we want to kill, intimidate, drive off the road, spit and harass. How did we become so disconnected with each other and we don’t see the ‘human being’ component. I am a daughter, a twin sister, an aunt, a cousin, a best friend, a human being. When did we as human beings become so transparent that our destinations became more important than the safety of human life? You’re wanting to END MY LIFE b/c I slowed you down for less than two minutes? Let’s take a moment and really digest that sentence b/c that’s what I deal with on a regular basis. Why is it drivers have more patience for school buses or public transportation buses when they make frequent stops yet they are ready to cut off and /or harass a person on a bicycle? What is the difference? The operator in any of these mode of transport is still a human being so why the fortitude with one and not the other? Our streets began with people owning the streets – not cars. Now, driving has become such a part of our DNA that this sense of entitlement and ownership has taken over our streets and our neighborhoods to where people will kill over it. I’m willing to die in order to change this mentality. I have been brought up to be a leader, not a follower. Streets are suppose to be mini theaters- acting out life experiences and this can’t happen when cars control streets. Families should want to take their kids on walks after dinner. Families should want to sit on their front porch or stoop and talk to neighbors about how ridiculous ‘Honey Boo-Boo’ really is. Nobody wants to do this when their front yards are three lanes wide and cars speeding at 40 mph. I look forward to the day when we realize that some congestion isn’t always a bad thing and that life WILL NOT END if you have to slow down. I look forward to the day when more people see change as a good thing and not fear it and react recklessly. ‘Girls in Gear’ takes to the street – ‘urban design’ style! 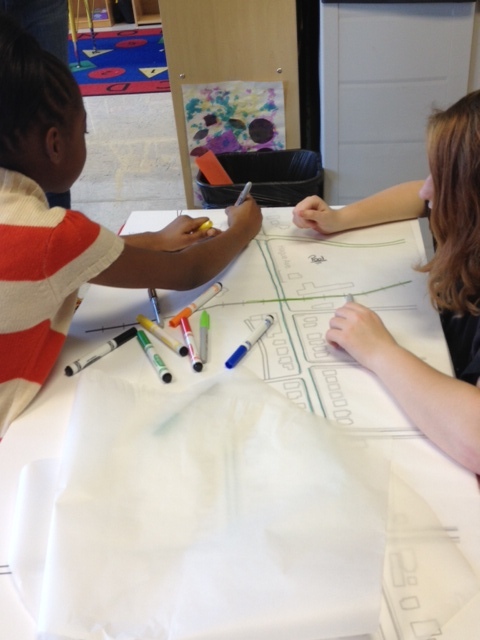 This past week, my program Girls in Gear moved into Urban Design, something I am very passionate about. 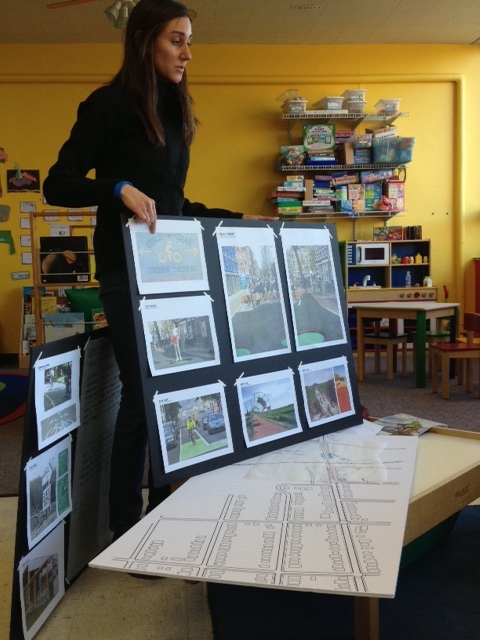 Opening up people’s eyes at how our streets have been designed and how they can be so much more. These girls, like the majority of our citizens have only viewed streets for one purpose – to get cars from point A to point B. Next time you take a walk, be conscious of if you even have sidewalks to walk on. So many of our neighborhoods especially the lower income neighborhoods, sidewalks have been eradicated to make more room for travel lanes. Opening up these girls eyes and minds showing them how much more a street can be is critical. 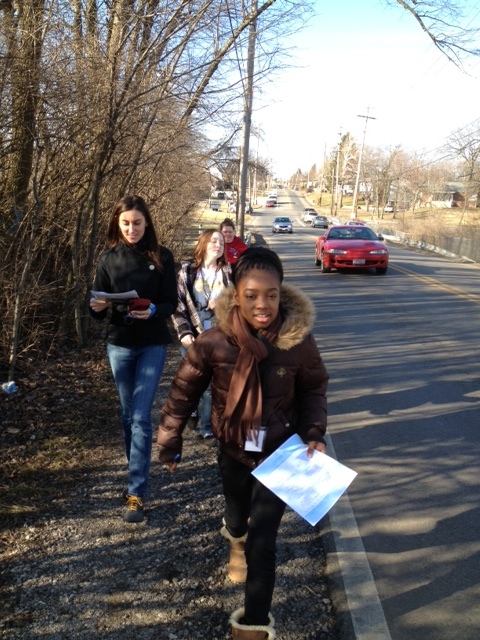 They should know that they deserve simple infrastructure such as a sidewalk when walking to school. They shouldn’t be ‘immune’ to gun-shells and used syringes in their playgrounds. The design of a neighborhood creates the tone in how a community will use that neighborhood. If you’re neighborhood is destroyed by four lane wide streets with cars moving at 4o mph, chances are there will be very little social interactions and enjoyment on these streets. Aside from the aesthetics of a street, the people behind the scenes creating these streets are predominantly men. I want these girls to know and believe that if they want to become planners, architects, or engineers when they grow up, they have just as good of a chance as men. Have you ever stepped outside your house and taken a walk or a bike ride and stopped to collect the way that you ‘feel’ on a particular street? Do you feel safe? Intimidated? Is the street pleasant to be on? Is it soft with textures of trees, lights, benches, few travel lanes,gardens, etc. or is cold and isolated with a slab of concrete serving one purpose – to get you to your destination? The majority of our streets have been designed by men. Imagine what our streets would look and feel like if the majority of them were designed by women? The majority of our streets built today are not women and children friendly in my opinion. 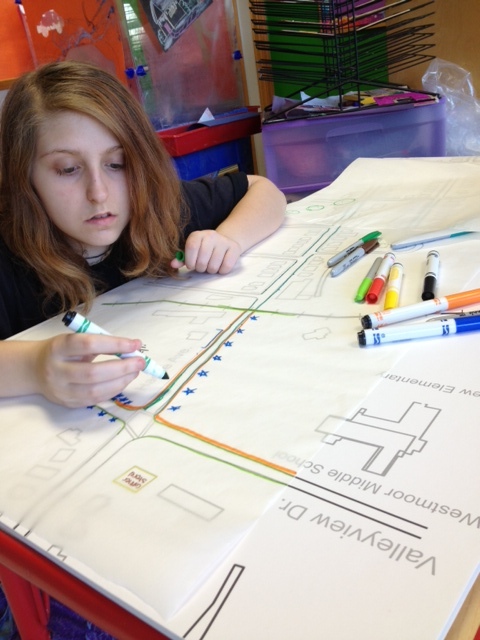 This is one of the reasons I’m introducing Urban Design to these young girls. 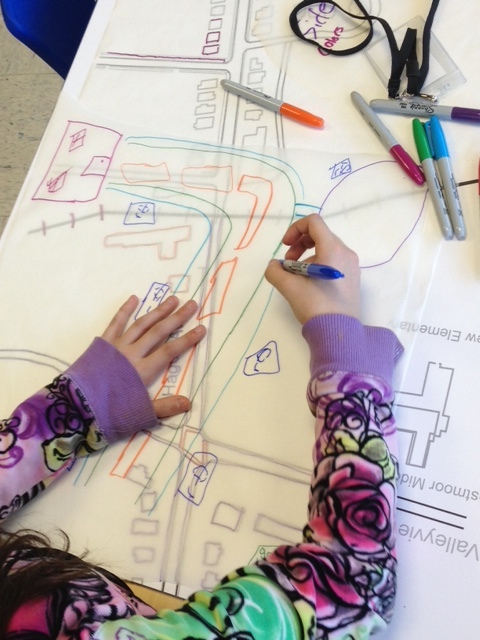 When a street is designed with women and children in mind, everyone will feel safer experiencing that street. Be safe and keep riding. Took the girls on a walk audit to score two streets. 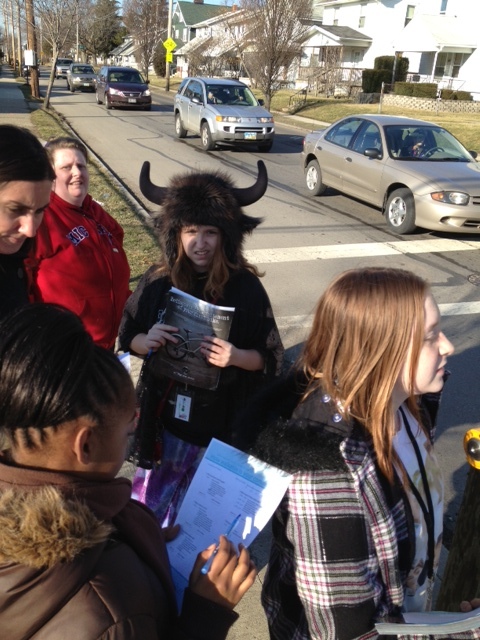 Group discussion as we wait to cross the street. 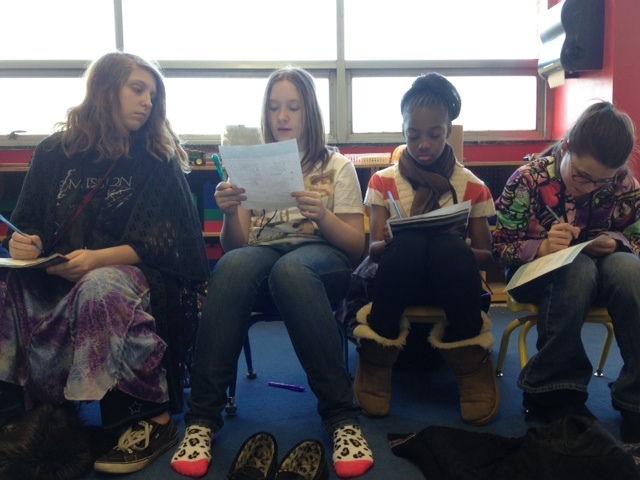 The girls discussing what they saw and felt on the two streets we scored. Abby Downs discussing streets more than just places for cars. 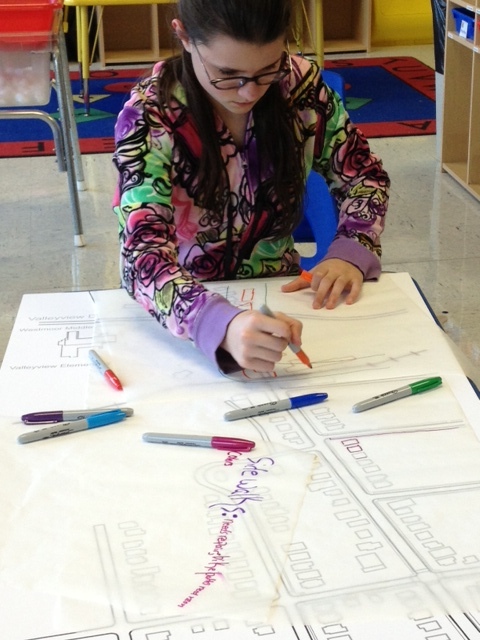 The girls beginning their designs of their ideal bikeable / walkable streets.